Well, it is that time of year again. The St. Louis Day of .Net is coming around again this August 20-21. I just found out this week that I get to participate as a speaker for a third year in a row. I am excited to see the event continue to grow and for there to be such great community involvement. As with other years, they are getting a great lineup of speakers and a greatly diverse topics which more than makes the price of admission well worth it. You can find all the information you need at the website. This year, I will be presenting a 300 level session called the “Kerberos Survival Guide.” Here is the synopsis: If it were just IIS, Kerberos, and you alone in a jungle, would you be able to survive the encounter? You will after you attend this once in a lifetime event! OK…in reality, if you come to this session, you will the learn basics of how Kerberos works, when you want to use it, what is needed to deploy it for any web site (including SharePoint) in IIS, how to troubleshoot issues, and how to do advanced delegation in code. Have you ever had this great recipe that you loved cooking over and over again? You got very comfortable with how to prepare the recipe and get it right every time. With time, something happens with that comfortable recipe and you decide it just is not as good as it use to be or just does not fulfill your hunger anymore. When this happens, you usually have a couple of options to choose from. Either you can completely skip using the recipe for some time or you start to experiment with the recipe to try to make it better again. So what on earth does cooking and recipes have to do with SharePoint? I am so glad you asked. So for almost fourteen years, I have been primarily an IT Pro working on infrastructure. Over these years, I spiced up my own personal recipe by moving from being a MS Windows server generalist to specializing in MS Exchange. From there, I have moved into the SharePoint realm which has so many great aspects to keep me busy. Well, I have been working for a while to add a twist to my SharePoint work which is to equip myself to do more on the development side. I believe to be a great SharePoint architect, you need a foot solidly in each camp (Dev and IT Pro). So why am I telling you this? Over the next months, you will start to see the “recipe” for my blog change just a bit. I have no desire to completely swap out recipes. But I will be trying to mix in more aspects of development while I keep talking about infrastructure. In addition, I continue to work on posting more frequently. I have come to realize it is easier to post more if I practice it regularly. This means regularly making myself sit down to write. I will be experimenting. I may get it wrong sometimes but my goal is to learn and make it better the next time. So feel free to let me know what you think and how it is going. On Saturday, June 12, I got the pleasure for a second year to present at SharePoint Saturday Ozarks. I sincerely enjoyed my time there again. Mark Rackley outdid himself again and put the event together beautifully. He is truly committed to making this event successful and he definitely did that. I am always impressed by the number of folks he can get from all over to attend an event in the Ozarks in Harrison, AR. For my presentation, I did the Kerberos Survival Guide (link to presentation) . My belief is that Kerberos is not as bad to setup as people make it out to be. However, it is difficult to setup if you don’t understand why you are doing the steps. So understanding is the first step. I want to continue to give this presentation to ground people in the basics so they can understand what they need to successfully implement and support Kerberos. I will be part of the panel for the SharePoint Road Show in Springfield, IL on Wednesday, December 16th. Hope to see you there! The SharePoint 2010 Road Show is an all-day event sponsored by Microsoft, International SharePoint Professionals Association (ISPA) and other local companies. The SharePoint Road Show has one goal in mind: SharePoint 2010 Education! You’ll see SharePoint 2010 in action, and have a chance to ask questions of professionals whom have been involved in testing in the months prior to the recent Beta release. Speakers include SharePoint MVP’s, SharePoint evangelists and other SharePoint experts from around the country. Alright, if you have been tracking the posts on the upcoming SharePoint release, you may very well say, “Yes, I know…I know. SQL Server needs to be 64-bit.” But I ask you to keep reading because I think there is more to the story. Let me very quickly review the 64-bit story for those who may not seen the posts. 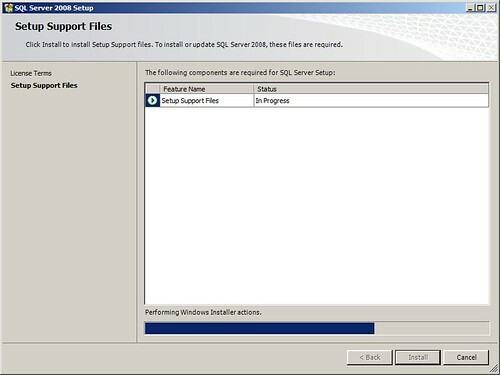 In order to install SharePoint 2010, your SQL Server will need to be version 2005 or 2008 and it will need to be 64-bit. You won’t be able to use a 32-bit SQL Server or a SQL Server 2000 instance. SQL Server is the heart of your SharePoint farm. I continue to repeat this phrase every opportunity I get to discuss SharePoint infrastructure. With the improved functionality of SharePoint 2010 or your current SharePoint 2007 platform, your usage and needs from SharePoint will continue to grow. SharePoint 2010 providing more functionality means you will need more SQL resources. The first place to start to ensure the infrastructure is ready for your needs is SQL Server. Does your current SharePoint environment’s response time meet your needs? Do you have enough capacity to handle your database growth for the next six months to year? These are important questions to evaluate now. If your answer to these questions is no or I don’t know, I want to give you some steps to begin finding the root of the problems. In evaluating the performance of a SQL Server, review these four components: processor, memory, disk and network. Disk is normally the primary bottleneck I find when evaluating client deployments. The disk subsystem needs to have enough disk throughput (or IOPs) so that it can stay responsive enough to your needs. For small to mid-size businesses, your disks should probably respond to requests within 20 milliseconds (ms). For most enterprise environments, a 10 ms responsive time is ideal. For high performance needs, you will design for 5 ms. Look at performance counters \Logical Disk\Avg. Disk sec/Read and \Logical Disk\Avg. Disk sec/Write. Memory bottlenecks on a SQL server are harder to identify so I want to provide some very high level guidelines: small servers need 8GB, medium servers need 16GB, and large servers need 32GB. I will do a future post digging into these sizing recommendations in more detail. Processor and network on your SQL server are pretty easy to evaluate. Processor should stay below 80% average utilization and not have any long sustained peeks at 100% utilization. Network utilization should stay below 70% average utilization. When evaluating bottlenecks, you want to evaluate and eliminate bottlenecks in this order: memory, processor, disk and network. There are reviewed in this order because the previous item could be effecting the item after it. As your use of SharePoint grows, you are going to want to manage the growth of your content databases. For collaboration environments, you want to make sure your content databases do not grow above 100GB. If they start to approach this size, you need to break up the content in different site collections and move those site collections to other content databases. Ensure you check the free space on each of your drive letters (LUNS). NTFS performance drops after the free space is below 25%. Therefore, no drive letter should not go beyond 75% utilization. You want to monitor how quickly your databases grow over time. This allows you to predict future storage needs and plan accordingly. These are a series of check you should do in your environment to make sure today that your SQL Server is ready for the SharePoint workload tomorrow. This blog post discusses the additional manual steps SharePoint Integrated Reporting Service instances will need in order to be fully patched correctly. As part of the October 2009 Microsoft Security Patch Release, the security patch MS09-062 contains fixes for SQL Server 2005 Reporting Services (SSRS). This patch will normally automatically be applied to your Reporting Services instances either through Windows Update or applied as part of your company’s normal security patch process. However, for Reporting Services instances that are installed in SharePoint Integrated mode, you need to apply an updated “Microsoft SQL Server 2005 Reporting Services Add-in” also. This will NOT be done automatically as part of the update process. In most deployments, this updated add-in will need to be applied on your Reporting Services server and all your SharePoint Web Front Ends. Basically, wherever you have already installed this add-in in the past. UPDATE – 10/13/09 They have updated the WSS package. It went live on October 7th. Now, you can safely download the WSS CU package using the link below and it should not contain the database attach issue. Links to both the WSS and MOSS CU packages are below. UPDATE – 10/01/09: They are updating the WSS CU package to resolve the issue described in the blog posts below…I will update this post again when the new package is live. Right now, you just need to wait for the new package and do not use the previous WSS CU version.